The seventh episode of Kieslowski’s Dekalog, Dekalog 7: “Thou shalt not steal.”, opens with the sounds of a child’s nightmare-fueled cries from the apartment complex that is the home of t he series. These cries offer the clue that this film will not only be about theft, but will also be about the essentiality of a mother’s love. 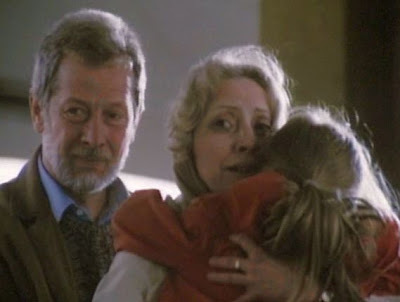 Ania, the crying child, is a six-year-old girl living in a family that includes Stefan, a retired musical instrument maker, his wife, Ewa, the headmistress of a school, and their 22-year-old daughter, Majka, who has just been expelled from the university. Majka does manage to spirit Ania away when she is attending a school function and heads off to hook up with Ania’s father, Wojtek, who had apparently been forced out of a teaching job by Majka’s mother six years earlier and now lives in a remote rural house, eking out a living as a toy-maker. Majka apparently wants to run away to Canada with Wojtek and the child, but the first meeting in six years between the two former lovers is not as warm as Majka had hoped. Fearing that Wojtek will betray her to the authorities, Majka flees his cottage, too. She calls her mother and gives her an ultimatum: either give legal permission for her to take Ania with her to Canada, or she will kill herself and Ania, too. The chilling telephone conversation between mother and daughter reveals the depths of contempt that they feel for each other. This Dekalog episode has more action, more of a conventional plot, than most of others. It is the story of a mother kidnaping her own child from the grandparents and trying to make an escape. These events include a getaway, a desperate search for the fugitives, death threats, and chance encounters – all the conventi onal ingredients of an adventure. But despite the fact that the plot of this episode has these adventurous elements, there is a narrative weakness, too. Too much backstory information has to be revealed by explanatory conversations. These take place during dialogues between Stefan and Ewa and between Majka and Wojtek. As a consequence, much crucial information is revealed by textual exposition, rather than by visual experience. On the other hand, the acting in the film is exceptional, even by Kieslowski’s high standards. 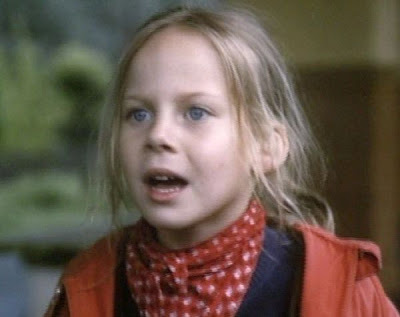 All of the players give outstanding performances, but perhaps the most amazing of all is the resonating performance of the child actress, Katarzyna Piwowarczyk, as Ania. But, as with the other Kieslowski efforts, it is not adventure that lies at the heart of the story. The real story in this episode is about Majka and her search for motherhood. From the very first images, when Majka is seen returning her damaged textbooks to the university office, it is evident that Majka is a person with no self-confidence. She is plain, untalented, and overlooked by everyone. Her mother, Ewa, by contrast, is self-confident, charming, and imperious. Ewa is used to giving orders and manipulating people to get her own way. When she gave birth to Majka, we are told, she learned that she could never have another child, and so she never forgave her daughter for causing this deficiency. Majka’s father, Stefan, is a kindly, but ineffectual, parent – unable to match or counter Ewa’s domineering ways. So it appears that Majka grew up seeing herself as a loser, unloved and unwanted. Her expulsion from college was undoubtedly just one more event in a long story of failure. In the end, she felt that perhaps Ania was the one person who might love her. After all, Majka is Ania’s natural mother – she has to love Majka. For Majka this was the opportunity to give Ania the kind of mother’s love that she, herself, never received. In this story it was Majka who was the unloved child that needed a mother’s love. This film suggest to me that perhaps there should be an additional commandment, in addition to “Honour thy father and thy mother”, for this modern age: "Love and forgive your child".